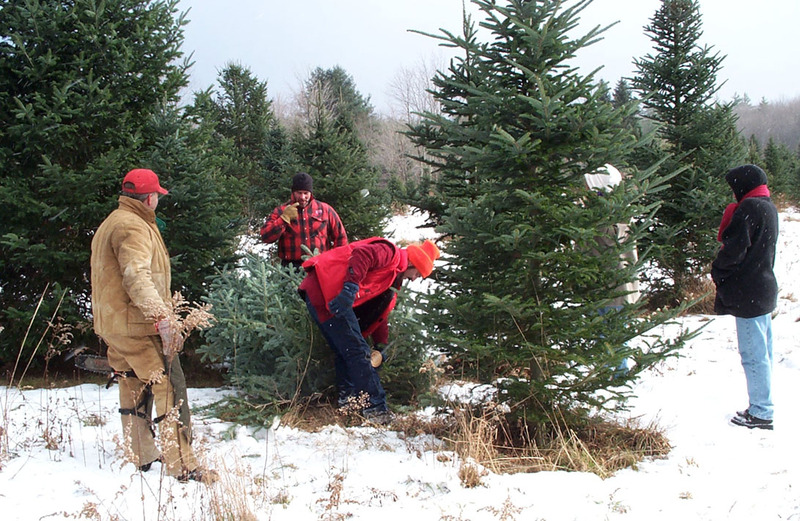 At Lamonts' on Park Road in Barkhamsted the subject is Christmas trees, year round. The place is called The Christmas Tree Plantation, but to new-comers and old-timers "Lamont's" is sufficient identification for the forty acres of trees. 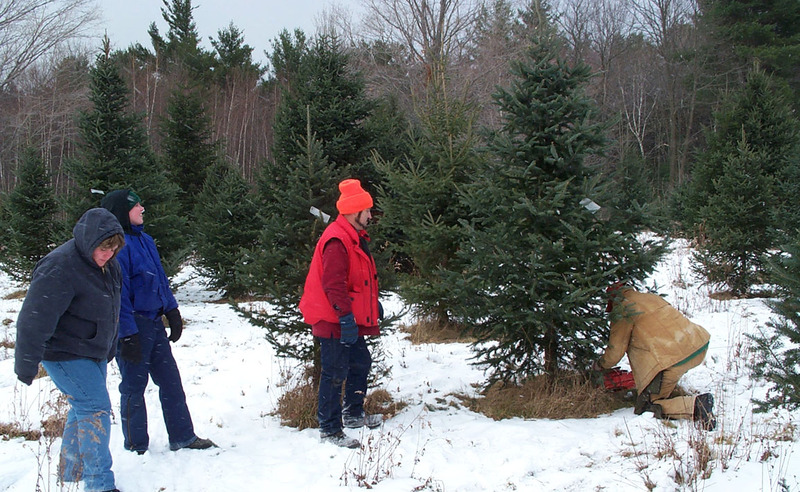 In 1951, Tom and Meg Lamont bought their pre-cut Christmas tree in Winsted and suspected that it had been cut in Nova Scotia in October. They decided that they were not alone in wanting a fresh-cut tree, so in the spring of 1952 they planted about five acres in white spruce seedlings and a few Scotch pines. Some friends of the Lamonts bought trees in 1958 and by 1960 word of mouth resulted in respectable sales. In those days prices started at $3.00 a tree and went up in 25 cent increments based on size and quality to a maximum of $5.00. 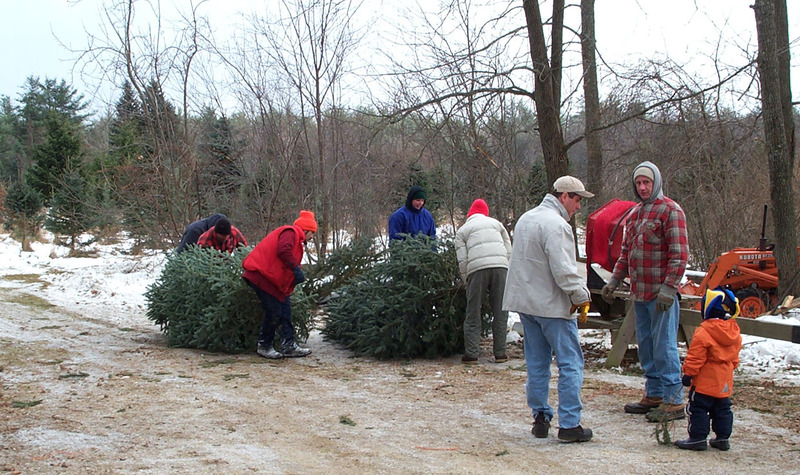 Photo- Lamonts' Christmas Tree Plantation on Park Road in Barkhamsted. An advertising flyer incorporating a map was distributed and radio spots on WTIC featured "With a tree from Lamonts. you get a room full of Christmas". With experience came change. The Lamonts quickly learned that many people chose to cut their tree early. White spruce has the shortest period of needle retention of the conifers used for Christmas trees, so more Scotch pines together with balsam fir and Colorado spruce, both with superior needle retention, were planted. At present there are six varieties of Christmas trees from which to pick. The most popular is the Colorado spruce, which may be green or have a distinct blue coloration. Genetics and soil composition seem to be the reason for the difference. Fraser fir, like the standard balsam, has short soft needles, "Christmas tree" fragrance and hold their needles well. A very similar recent introduction to the trade is Canaan (pronounced Kuh- NAN) fir with the same desirable characteristics and a tolerance for less than ideal growing conditions. Concolor fir, with much longer needles and aroma many call "citrusy", sell out quickly because of increased demand and difficulty of getting really good planting stock. White pine is the least sought after but devotees love the soft long-lasting needles and have adapted to tiny lights and miniature ornaments which is all the pine branches can support. 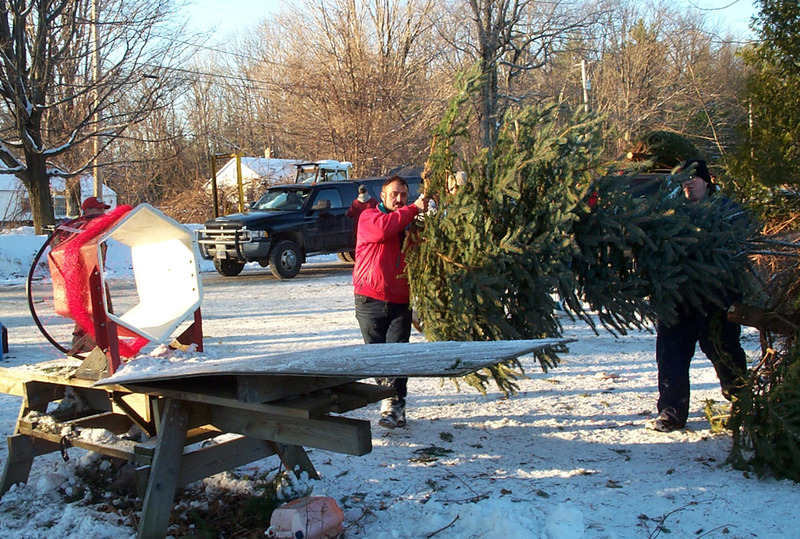 Photos- The customer finds a nice tree and Dan Lamont (red jacket) directs the cutting and prepares to drag the tree out to the parking lot. Since Tom's death, most of the work on the Plantation is done by Dan, his younger son, whose efforts start in January and end in December. Pruning begins in January and is done with hand tools which include pruning hooks, knives, pruning shears and long-handled clippers. Just about every tree must be sheared every year to produce the proper balance of top to lateral growth and frequently market-sized trees are done again in the fall. Planting is done as soon as the frost is out of the ground. Newly purchased seedlings are put in transplant beds and the best of the trees that have been in beds for two or three years are put in the field. Trees that were harvested are replaced, new straight rows are planted where land is cleared and unsellable trees have been culled. Tree farming is just that: farming. Any farmer knows that weather is the final, critical ingredient in the success or failure mix. Frost, heat, drought, deluge, snow and ice are all part of the risk in farming. Drought is most devastating to young trees. Ice and heavy snow can destroy mature ones. An ice storm is most dreaded at Lamonts' but unlike earlier storms, the ice of 2002 melted quickly and did little damage. Photos- at left, dragging the trees to the loading area. At right, the tree is lifted to the baling table. The baler will "tighten" down the tree to make it easier to transport on a car. The field planted trees have hazards other than the weather. Deer browse buds and later strip bark removing velvet from their antlers. Mice and moles girdle tree bark and strip roots while their burrowing exposes roots to the air. Rabbits will cut down a seedling at the base. Researchers are working on repellants and deterrents but the Lamonts acknowledge that the animals are here to stay. Their defensive weapons are rotary mowers. Short grass not only eliminates nesting areas but exposes small rodents to predators such as hawks, owls and coyotes. The trees also benefit from the mowing directly: air drainage is better, there is less competition for fertilizer and herbicides are more effective, all of which improve the survival rate and quality of Lamont's Christmas trees. Careful planting is imperative so roots and buds are not damaged. Planting is done by teams of two; one with a spade prepares the site and the other puts the tree in the ground. Soil conditioners and nutrients are supplied for the transplants. Later fertilizer and lime are broadcast among the larger trees except during severe drought conditions when there is not enough moisture to dissolve the granules. Spring brings emerging insects. Aphids are the biggest problem. Uncontrolled, they can cause needle loss and discoloration. Dan sprays the Plantation with a soluble oil to smother the aphids and their egg masses. While still a problem, aphid populations have been significantly reduced by phasing out Douglas fir, a favorite of one of the more the more destructive aphids. In recent years there has been no gypsy moth damage, but in the mid 1980s the infestation was so severe that tree sales were suspended except for white pines. Shearing is an ongoing chore but only the pines have a critical window. Sheared too early they resprout and produce undesirable second growth, sheared too late they do not set buds and have no new growth the following year. Cosmetic shearing continues even while the marketable trees are being tagged for sale. Dan and Meg appraise each tree and decide on a price. The majority fall in the $25 to $30 range for an eight foot tree. Larger trees of superior quality can cost $40 to $50. There is a limited demand for trees over ten feet, but the Lamonts always have some. All white pines are $20. One year Tom and Meg wanted to have a little fun: they found a perfect tree and marked it "FREE". During the selling season, dozens of people inspected it, read the tag and walked away, usually looking back at the tree. At the end of the season the tree still stood. People were just too suspicious to take advantage of a deal too good to be true. Once the trees are tagged, postcards are sent to customers about ten days before the Plantation opens on the first weekend in December. Some customers return for the fortieth time, some come for their first. There are families spanning three generations waiting while the kids line up for candy canes. Lamonts' Park Road location, deep in rural Connecticut, seems to enhance the charm of finding the family tree. There are about twenty people ready to help in that search. They cut, carry, bale and load the trees on the customers' vehicles. The Lamont family is a big part of the crew and there are other workers who have been at the Plantation for so long that they are presumed to be family. There are customers who are like family, too. 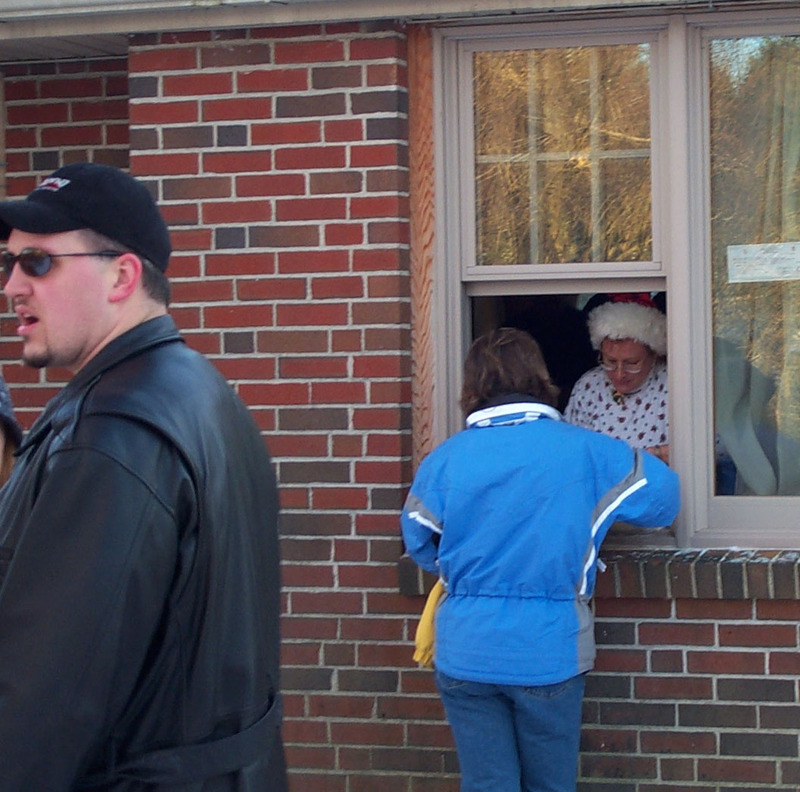 One lady brings dinner on opening day, fearful that cooking at the Lamont house stops when tree harvesting starts. Her daughter brings dessert. Homemade cookies and candies are delivered to the kitchen, and new and exotic ornaments arrive for the Lamont tree. Sometimes it is hard to believe just how important the Christmas tree can be, but when a customer reschedules a business trip or a visit to out-of-town relatives in order to get a tree on opening weekend, the Lamonts realize how rewarding the hard work put into their business can be. When it is time to put up the "CLOSED" sign and the Lamonts prepare for their own holiday, there is the bittersweet realization that January is only weeks away and the cycle of work will start again at Lamonts' on now quiet Park Road in Barkhamsted. 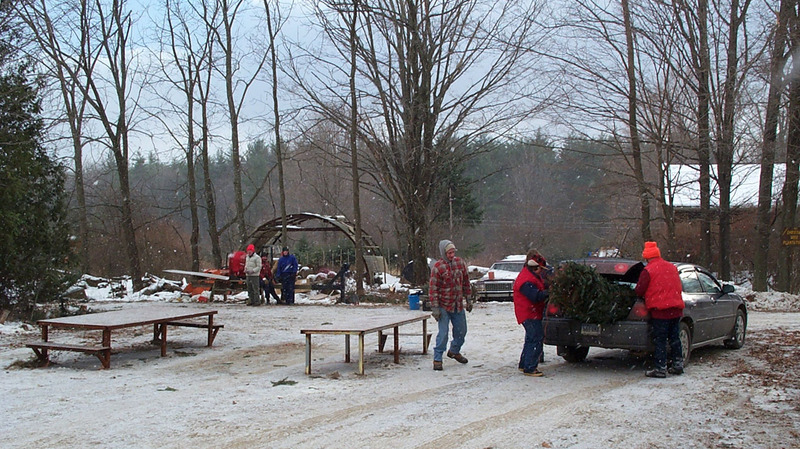 Photo- Workers load the Christmas tree for the customer. Photo- Meg Lamont in the holiday spirit collecting from customers who have selected their tree and are "bringing home a room full of Christmas". Photo- The Lamont Christmas Tree Plantation.